Jungle Scout has always been focused on making Amazon product research as easy as possible. While the Extension and Product Database have made it 10x easier to find amazing product opportunities, I think we have cracked the code to make Amazon Product Research 50x easier. It is a new feature in the Web App called Niche Hunter, and it is now the easiest way to identify niche opportunities in Amazon. There are currently almost 1 million niche opportunities, and we are expanding that list every day. Considering that there are millions of niches and keywords, and within each of those thousands of potential product ideas, I would say that there is ample opportunity to take advantage of! Need help finding profitable product ideas? Get our list of 10,000 niche product ideas! Well, you can now get my opinion on a product/niche opportunity! 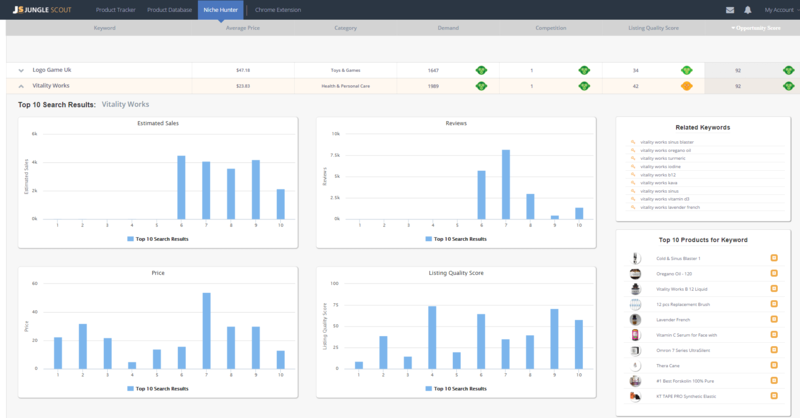 We’ve put together an algorithm that weighs the various inputs that would determine a good product opportunity (monthly demand, competition, price, quality of competitive listings, and more), and created a numerical “Opportunity Score”. So from a range of 0-100 (with 100 being the best opportunity for sellers), you can immediately get a holistic view of how promising a niche is. And if numbers aren’t your thing, just try to get as many blue bars as possible. 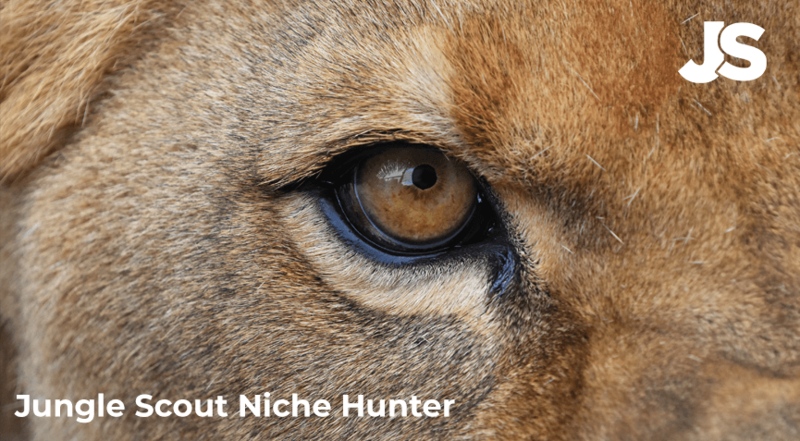 So what used to require a flurry of clicking on products, scribbling Best Seller Ranks, Number of Reviews, Price points, and then making a guess at how lucrative the product niche could be is now completed with one click in the niche hunter! And if you see some potential, but not the niche you want to pursue further, the Niche Hunter pulls all related keywords that Amazon deems to be related searches. The Top 10 Products for the given keyword are also displayed for quick reference. With one click, you can add the product to your Product Tracker, so that you can do proper due diligence and collect actual Amazon sales data before making any final decisions. Or just click on the product and immediately see the actual Amazon product page so that you can get a better understanding of the Product Title, Product Images, quality of reviews, and whatever other criteria you use when evaluating product ideas. I am incredibly excited about the potential that this feature brings to the Amazon seller. And with 500,000 new products added to the Amazon store every day (an interesting stat pulled from the infographic we published recently), you will continue to see more niche opportunities added to the Niche Hunter. It is available to anyone on the Web App Standard and Pro versions. Get started hunting now while the opportunities are abundant! Hey Dave, I’m now using JungleScout Webapp Niche Hunter and JungleScout Pro. But i don’t know how to choose products via Niche Hunter. Lots of results and disorderly. Can you help me? 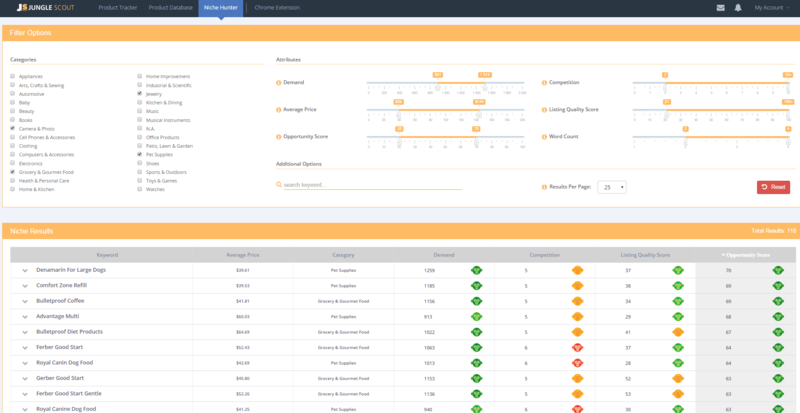 The easiest way to go about it is to set the filters based on your product criteria. From there, I usually scroll down through the opportunity scores and look for non-branded products. I’m with Gary and Phil there. I recently purchased the JS Pro. with 3-month web app and been watching videos/tutorial on how to use these tools. Just tried the NH and am a bit confused as the results didn’t show any green/red monkey faces or the blue graphs but rather these red/green/yellow bars. I’m not sure what to make of these or how to interpret them. After watching every tutorial, I felt confident and thought I was ready. But when I actually started, these tools seemed overwhelmed and intimidating. Thanks for your feedback. This really helps us with outreach and our customer service stuff. Right now, I believe that Lenny’s working on some new material for the niche hunter video. Additionally, you can ask myself or any of our CS people for help, and we’ll jump right in. I usually reply to comments M-F in the AM, and the CS team is 24 hours. Sorry you are having problems using the Niche Hunter. To help you out as quickly as possible, I have passed on your comments to our friendly support team who are going to reach out to you and offer some guidance. In the meantime I will take on board your comments about the existing content to help people navigate the tool. We’re always looking for ways to improve so thank you for leaving your feedback on this! s how much is the niche hunter upgrade? and is it a monthly option? Thanks for this. A keyword ranking tracker and super url builder would be highly appreciated as well if you can include it on the web interface. It would make JS a one stop shop really. Thanks for the thought, I’ve just passed it along to Greg and the Dev team as well. Great product! I’d like to know how you are determining some of the scores and that stuff… I typically use merchant words to validate demand and cross reference SERP to feel out an opportunity and this seems to be doing something similar but I’d like to know more. Any chance I can spend 15 minutes on the phone with someone from the JS team? Your methodology seems to make sense for validating demand. Have you also used Google Keyword Planner to get some search volume estimates for specific search queries? Granted, it is for Google traffic, but a good proxy for Amazon traffic. The Opportunity Score is based on a combination of demand, competition, listing quality, and other key metrics that help define a good opportunity from a bad opportunity. Hope this helps! Thanks for your comment, and explaining your issue. If I understand you correctly, yes, it sounds odd. Can you send the ASIN and maybe a screenshot to [email protected] and we can address it with more specifics. Thanks Joe! I agree with Emil on the brand name. Also something that would be REALLY nice is to show the median demand as opposed to the average, that way you can get a better sense of whether or not the keyword has one or two items with all of the sales. That is a great point, to consider the median instead of the average. However, the algorithm does account for outliers that can skew figures out of wack. Hope that this helps, thanks for the feedback! The first thing that strikes me when using Niche Hunter is that a HUGE number (probably the majority) of keywords with high opportunity score include brand names. And since it’s, at least, grey hat to use those keywords it’s a bit tedious to mentally sort out those terms… I would suggest adding a feature that makes it possible to exclude keywords which include the brand name of the product. Thanks for the feedback Emil. We’ll work with the developers to try and figure out a way to do this. It is kind of tough to teach a computer how to pick out brand names but I’m sure we can figure something out. i think as well u should give more video training how to use this niche hunter its a bit confusing….. Thanks for the feedback David, we are working on it and will have it done ASAP! This product is just AMAZING! Great job. Well done. Hey Ahmed, glad that you think that! Already own JS and this, NH, looks very useful, but would like some more detailed training on how to use this for maximum benefit…like a video walking us through each step and what that means…thanks for the great products,look forward for more training…until I can see more on how this works not sure I’m ready to upgrade. Hey Gary, thanks for the feedback, we will get something together to clarify how it works so you get a better understanding of it. Were you able to play around with it yourself yet?